Tanja Hester explains why she had to call it quits on the side hustle she loved in order to create new opportunities at her primary job. Plus her big money tip on how to save big on medical expenses while traveling the world. Within that year of quitting, I got promoted. I was able to take on a lot more interesting assignments at work. I was able to start traveling more, which I did really enjoy. Ultimately for me, it's crazy, but yeah. As much as the side hustle served me earlier, it was giving it up that really let me get ahead. You're listening to Financial Grownup with me, certified financial planner Bobbi Rebell, author of How to be a Financial Grownup. You know what? Being a grownup is really hard, especially when it comes to money, but it's okay. We're going to get there together. I'm going to bring you one money story from a financial grownup, one lesson, and then my take on how you can make it your own. We got this. Do you guys have side hustles, multiple income streams? It's kind of becoming the normal thing to do these days, but they are also, if we're being honest, second jobs, and sometimes it just becomes too much. Welcome everyone. The show is growing and we have a lot of new listeners. Thank you for checking us out. I would love to learn how you heard about the show, so special ask here. Let me know how you heard of the podcast. DM me on Instagram at BobbiRebell1, or on Twitter at BobbiRebell, and you can always email at hello@financialgrownup.com and feel free to give other feedback as well. All right. Let's get to our guest. She is Tanja Hester. First of all, she has one of my favorite podcasts, The Fairer Cents, with Kara Perez. She also is an award winning blogger. Her blog is called Our Next Life, and we were able to get her on the show because of her new book. It is called Work Optional, and based on the story she shared, it also could be called "And Side Hustles Optional," because it seems like everyone expects you to have a side hustle these days and sometimes you just don't or you just can't anymore. And learning when it is okay to say no is definitely a very Financial Grownup thing. Here is Tanja Hester. Hey, Tanja Hester. You're a financial grownup. Welcome to the podcast. Hey Bobbi. I'm so happy to be here. And I am happy to be talking to you about your new book: Work Optional, Retire Early. A lot of people already know you though because you're an overachiever, Tanja. You have, first of all, your blog. Beyond the fact that you're a part of the FIRE movement and you are financially independent, you are retired. This is some busy retirement by the way, just saying. Your blog, Our Next Life, was Blog of the Year for the Plutus Awards, which is huge. I am not a Plutus Awards winner. I was nominated though. This podcast was nominated, I should say. You're also the cohost of really one of, if not my very favorite podcast, Fairer Cents, so love all of them. So happy to have you. Thank you. Wow, that was the best intro ever, I think. But it is all sincere and all true. I really loved your book. I actually have asked you to talk about a money story from your book that really hit home with me and I think is really relevant to so many listeners, and something we're going to be talking more about, and that is the flip side to the side hustle and when to know when to call it quits basically, because in the book you talk about leaving your side hustle as a yoga instructor, and I really wanted to hear more. So tell us your money story, Tanya. Yeah. I started my career in DC and then LA, and at the time I was making not no money, but close to no money, especially considering how expensive those places are to live. And so I started teaching yoga when I think I was 23 or so. I loved yoga. I needed a side hustle. It was relatively low startup cost. I really do recommend actually teaching fitness for folks who want a side hustle, because you get paid to work out, and the overhead, you don't have to invest a whole lot to get certified, and it also makes you really comfortable on your feet and makes you a better public speaker, which are all my side effects. I did that for a long time. I also then started teaching spinning to supplement that, so I was doing both yoga and spinning. Yeah. About eight or nine years in I started realizing, for my main job, which was as a political consultant, I was having to travel a lot and I was starting to sub out more classes, or I was occasionally having to say no to things at my main job because of my class schedule, or I felt like I was subbing out too much stuff. Because you had to have a commitment to that people. You were on the schedule. Yeah. Yeah, and I had students who were my regulars who expected me to be there. It just got to a point where my main career and my side hustle were really in direct conflict with each other and I realized that continuing to teach yoga on the side was actually holding me back in my career, and was preventing me from being able to be a full team player, being able to say yes to things, so I made the really hard choice to give it up, which was hard because I love teaching yoga. I loved that community that I built, but within that year of quitting I got promoted. I was able to take on a lot more interesting assignments at work. I was able to start traveling more, which I did really enjoy. Ultimately for me, it's crazy, but yeah. As much as the side hustle served me earlier, it was giving it up that really let me get ahead. How did you prepare to lose that income stream? Because that is something a lot of people worry about. The truth is, I want to be clear that I'm in a financial unit, so my husband Mark was also working really hard through all of this and he had earned more. I think that this, I'm not remembering exactly, but I think he may have gotten a little bit of a promotion that year that I quit, so that kind of smoothed it out a little bit. But the truth is, by that point, we were both earning significantly above what we were spending, and so it was just a question of maybe taking a tiny temporary hit in what we were saving, but we were living so far below our means that it wasn't a question of constraining any spending because of it. What is your lesson for our listeners who are getting such a very strong message, many of us, about having those multiple income streams, having those side hustles? There's downsides to it. Yeah. There potentially are, and I think it's just being aware and intentional about what all of your options are. So if you're in a low level job right now and you want to stick that out, I think it's just paying attention to, is there a point at which having a side hustle is going to be too big a distraction? Is there a point at which it's going to start to hold you back? You know, I really am very pro side hustle, but I think it's just noticing that this may not be forever, or there might be stages in my life when I need to focus on one thing. So that's really I think what I'd advise, is just be smart about it. Just keep your eyes open. And side hustles don't have to be forever. Absolutely not. They can be a great chapter of your life. I think of the decade when I taught yoga as a really special thing, but that doesn't mean I still have to be teaching it now. All right. Let's move on to your everyday money tip. This has to do with health care, actually. It's a better time to be early retired with healthcare than it used to be. Before the Affordable Care Act, people who didn't have a traditional job, and that could be freelancers and side hustlers and gig economy folks too, but we didn't necessarily have good ways to get it. Now with the Affordable Care Act, you can buy insurance, but for most of us that is not going to include dental or vision, and so a great way to save some money if you especially love international travel anyway, is when you're traveling, to schedule a dental cleaning, or schedule an eye exam, or do some of the predictable medical stuff that you know you can schedule when you're abroad. I think as Americans we tend to think of the rest of the world as not having high quality care, but that's just really not true. You can do a lot of the stuff for pennies on the dollar compared to what we pay here when you're already taking a trip, and if you're older and you need something like a hip replacement, it's worth pricing out what it would cost in a place like Thailand or India versus at home. Often, even if you have insurance, the total cost out of pocket in another country will be less than what you'd pay after copays and everything here. What's been your experience? Have you done it? You know what? I have not yet. We just haven't had the opportunity because we're only a year into early retirement, but for the book I interviewed a bunch of people who had and really heard nothing but positive experiences. We'll have to look into that. Alright. I want to talk more about your book Work Optional: Retire Early the Non-Penny Pinching Way, because it really draws from your experience. You mentioned FIRE, which stands for "financial independence, retire early." Is that correct? By the way, your blog also won best FIRE blog I think the previous year, so you're an all star on all levels, but there's a lot of things that I like about the book, and one of them was, as a parent myself, that you also address the challenges that parents face when they have this goal of FIRE. Yeah. I did not want the book to be, "Here is the story of how Mark and I did this." I think that's pretty boring. We also recognize that a lot of our circumstances are not applicable to everyone or easy to replicate. We got really lucky in some key ways. We didn't have huge student debt. As you just said, we don't have kids, so I wanted to make this a book that was accessible to just about anybody, so I included a lot of case studies with parents. In fact, most of the people featured in the book have children, because I just felt that was so important to cover. Some people are couples who are earning under six figures combined, some single folks, so it's really trying to cover the bases. But yeah, I'm a huge believer that you can build a plan that works for you and you can, even if full retirement isn't an option, you can at least create a life where work is more optional, whether that's being able to cut back or take a year off or just work in a job that's fun for you as a part-time thing. I really do believe that it's accessible and so that's really what I set out to do with the book. Another thing that really stood out to me in the book is a data point that you bring up, and that is that most people, we talk about the idea of choosing to retire early, but the truth is, data shows that most people don't actually even retire when they plan, so we think this is a choice, but really a lot of us just have to be ready whether we like it or not. Oh, it's so true. I feel really strongly about this because I get frustrated when there are new stories about early retirement that sort of go like, "Hey, look at these young weirdos." Because I think the discussion about early retirement should be inclusive of everyone, because as you said, that's just reality. We know that most Americans intend to work to 66 or 67, but end up having to retire at 62 or 63 on average. Although for many workers it's a lot younger, because companies are generally pretty cruel to those over 50. They lay people off without really much regard for how it's going to affect them, and so a ton of us, two-thirds are not retiring when we plan, and we also know that more than half of Americans are wholly reliant on Social Security as their only retirement income, which the very highest social security checks only give people about $30,000 a year. So we're talking about a real crisis and a real problem that just being able to put yourself in a position where you can retire securely is already enormous, and if you can put yourself in a position to be able to retire even sooner, all the better, because we just don't know what the future holds for all of us. Wow. All right. Everyone needs to check out Work Optional. Tanja, before I let you go, please tell us more about where people can follow you, your blogs, your podcasts, your books, all of you. There's so much happening in your retirement, Tanja. I know, I know and I know there are those who will say I'm not retired, but this is all stuff that I'm choosing to do that feels like play, and I feel lucky every day. My main site is ournextlife.com. From there you can find everything else. The podcast is The Fairer Cents, C-E-N-T-S on iTunes and all the podcast places. On social, I'm @Our_NextLife, mostly Twitter and Instagram, but from Our Next Life, you can kind of find all the different tentacles I have out there, get info on the book. The book is in all the normal book places, so yeah. It's a fun, fun thing to do. Amazing. Thank you so much Tanja. All right, my friends. Let's do this. Financial Grownup tip number one. If you have a side hustle, be clear about its purpose. For Tanja, it no longer was a needed income source. It was fun. She liked it, but it was holding her back. If the point of your side hustle is to build a business so you could leave your job and things are on track, of course you should stick with it, but as we move up in our primary jobs, side hustles can be a distraction, and you could be missing opportunities even just by not being as focused on the main job as you could be. Financial Grownup Tip number two. Tanja talked about medical procedures overseas that are planned. Even if you don't plan to have something done, it's a good idea to note if your health care insurance is valid overseas, especially in the case of an emergency. In many cases, insurance will cover an emergency but will only reimburse you once you get home, so you have to pay out of pocket while there, keep the receipts and file afterwards. This actually happened to my family. We were vacationing in Jamaica and my son cut his head after falling getting out of the shower. We had to go to an emergency clinic and pay 100% out of pocket. The insurance company would not promise whether or not they would pay, and in the end they did pay as an out of network expense, but there you have it. By the way, Harry was completely fine. If you are traveling internationally, know what your health care coverage is and make a plan just in case you have to see a doctor while you are traveling. And thanks to all of you, my Financial Grownup friends, for joining us. If you like the podcast, please help us grow, please, by sharing with your friends, and take a moment to leave a review as well. We read every one and they really mean the world to us, and they help us get discovered. 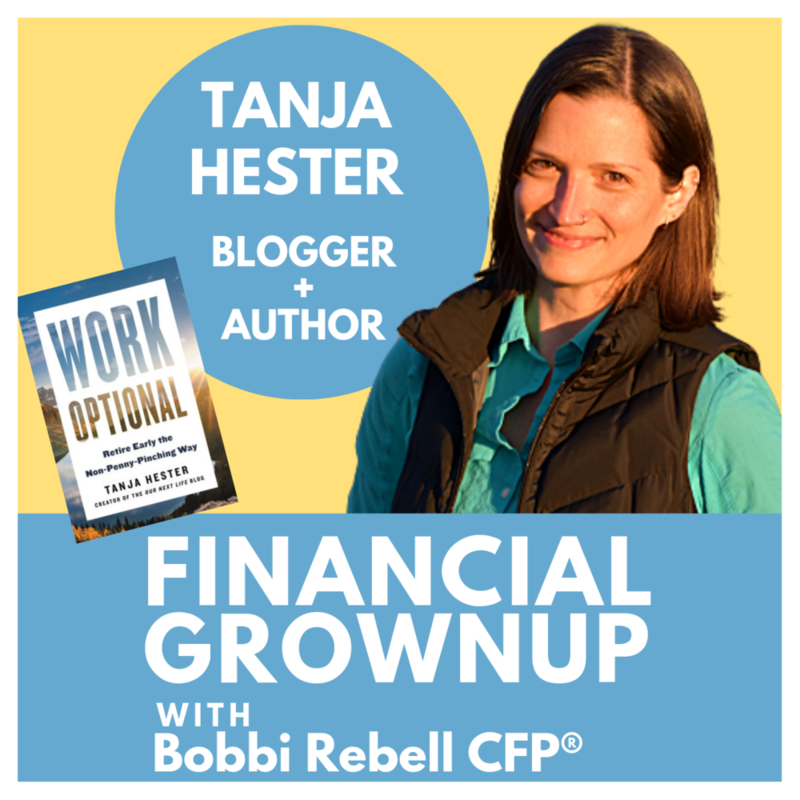 Big thanks to Work Optional author Tanja Hester for helping us all get one step closer to being Financial Grownups. Financial Grownups with Bobbi Rebell is edited and produced by Steve Stewart and is a BRK Media production.